Tablets (100 tablets in carton). Wide range of natural biological stimulators including laminaria, amber acid, brewers yeast, antiseptic Dorogov’s stimulator. Manufactured from natural ecologically clear raw materials. No artificial preservations and coloring agents. Kostochka vitamin-mineral feed supplement (containing physiological proportion of calcium, phosphorus, vitamins, microelements and biologically active substances) is used for prevention of vitamin-mineral impairment and provides strong beneficial effect on all animal organism. 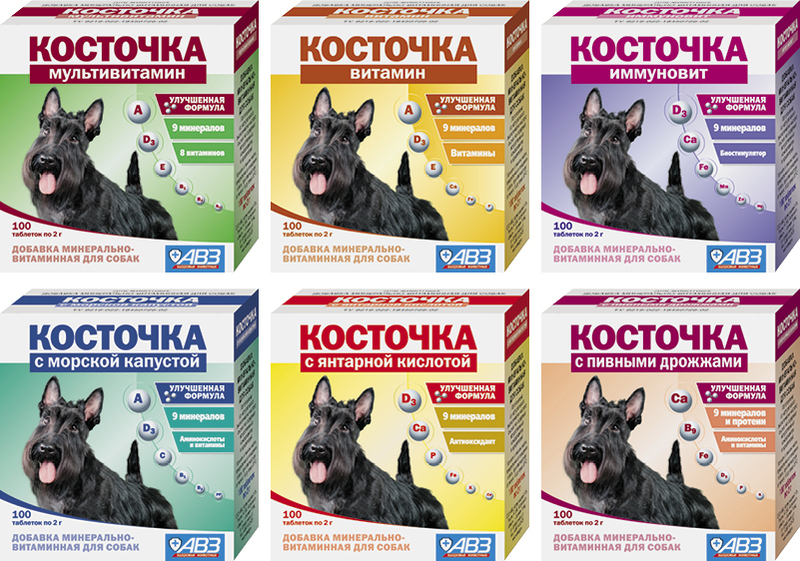 In spite of optimal proportion of living organism ''constructional material'' (calcium, phosphorus, potassium, zinc, iron, magnesium, copper, manganese and cobalt), Kostochka contains natural biological stimulators including laminaria, amber acid, brewers yeast, antiseptic Dorogov’s stimulator. 1. Kostochka Brewers Yeast contains calcium, phosphorus, D3, В1, В2, В5, В6, В12 vitamins, protein, biotin, folic acid, amino acids (alanine, arginine, cystine, glycine, tryptophane, tyrosine, methionine, threonine, glutamic acid, serine, proline, valine). Feed supplement normalizes metabolic processes, prevents skin diseases and provides hair growth and its structure improvement. Pregnant and lactating females; puppies; animals with skin diseases; long-haired dogs. 2. Kostochka Laminaria contains calcium, phosphorus, microelements, C, D3, В1, В2, В6, PP vitamins, iodine, sulfur, argentum, carotenoids, phospholipids, chlorophyll, glycolipids, porphines and more than 15 amino acids. The feed supplement has growth promotion properties, normalizes metabolic processes and digestive system activity, improves hematogenesis, increases total organism resistance, provides hair growth and intensifies its coloration. Animals with vitamin-mineral impairment; dogs in environmentally unfriendly, stress conditions; puppies; pregnant and lactating females. 3. In spite of calcium, phosphorus, 6 mineral substances, protein, amino acids, vitamin B complex and vitamin D3, Kostochka Immunovit contains elixir of life (antiseptic Dorogov’s stimulator). It has strong beneficial effect on nervous, immune and endocrinous systems, promotes gastrointestinal motor activity, improves digestive processes and nutrient availability. The feed supplement promotes epidermal regeneration, protein and nucleic exchange and improves tissue trophism. It causes immunodefence activation and accelerates ill animal recovery. Puppies; pregnant and lactating females; weakened animals; dogs with metabolic disorders. 4. Kostochka Amber Acid contains calcium, phosphorus, potassium, magnesium, zinc, copper, manganese, iron, vitamin D3 and amber acid. Amber acid promotes nervous system, improves activity of kidneys, intestine and cardiac muscle, provides anti-inflammatory, antistress and antitoxic effect and increases drug efficiency. This feed supplement promotes recreation in ill, recovering, old and weakened animals. Animals in increased physical and psychological load; after serious diseases; in puerperal period; in weakened disease resistance. 5. Kostochka Vitamin contains not only calcium, phosphorus and microelements, but vital vitamins complex (А, D3, Е). The feed supplement has significant growth promotion properties, normalizes metabolic processes, enhances osseous system and canine infection resistance, promotes increase in fertility and delivery of healthy puppies. Puppies; pregnant and lactating females; dogs of all ages when total mixed ration (dry or canned) feedings are not used. 6. Kostochka Multivitamin contains calcium, phosphorus, potassium, magnesium, zinc, copper, manganese, iron, А, D3, В1, В2, В3, В6, В12, E vitamins). Effective in hypovitaminosis and frank avitaminosis. The feed supplement has beneficial effect on animal organism in diseases of nervous, cardiovascular and digestive systems, reproductive function disorder, lower disease resistance, as well as during pregnancy and lactation. Pregnant and lactating females; lay period; prevention and treatment of hypovitaminosis; in vitamin impairment in ration; in metabolic disorders; prevention and treatment of puppyish rachitis. 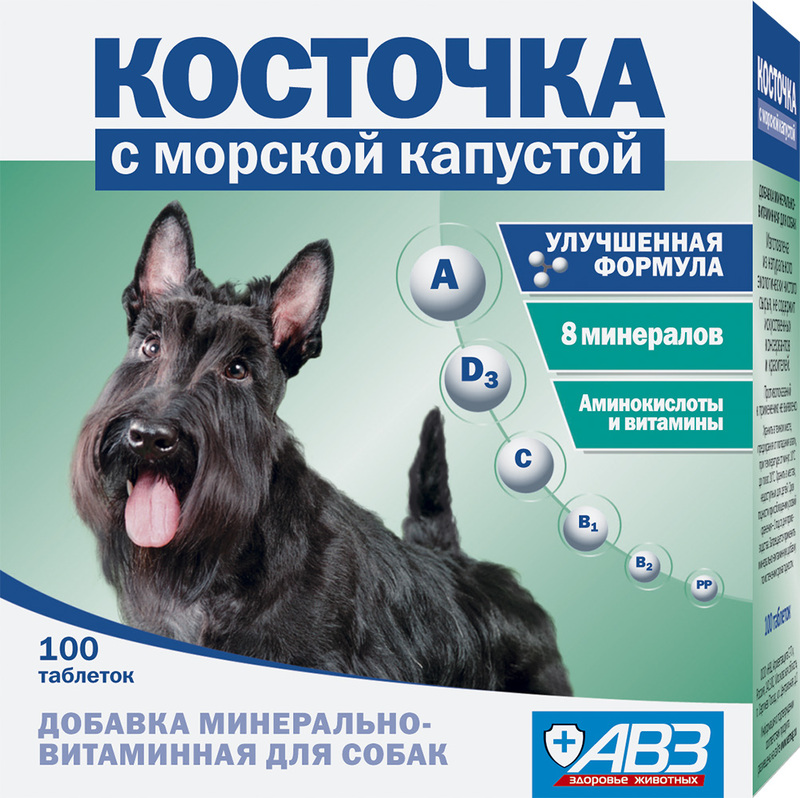 Every day use Kostochka during morning feeding with small amount of feed in following doses. Store at -10…+20°С. Protect from light and moisture. Shelf life is 1 year from manufacturing date.